I was most honored and surprised by being “tagged” by an author of who I have the utmost respect. 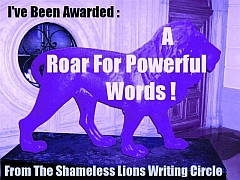 Roads at http://thepriceoflove.net placed me in good company on his blog and recommended me for an award from “The shameless Lions Writing Circle”…. 1. Link back to the person who tagged you in your post. 2. List three things that you believe are necessary to make writing good and powerful. 3. Tag five other people via comment. The most formidable task, for me, is the linking part. I am to link back to the author who recommended me for the Award. Linking is an “IT” kind of thing and “IT don’t know” much…So I “linked” the best that I know how. It doesn’t look as good as Road’s links on his blog, but it is not about how good the links look as much as it is that you discover his site and the other sites, if you are walking on this path. So, the first thing that I believe it takes to “Roar” as an author is to convey your thoughts well. As Beethoven did with his music, words are the author’s tools to express you passions, fears and all manner of intangibles made tangible. The second quality must be the ability to tell the story. I always loved it when my father told me stories. He rarely read one, he always told it to me and I would hang on every word…writing is story telling and you have to be able to tell your story in a way that is uniquely yours. I am telling my heart’s story as I write “Walking in the Valley of the Shadow”. The value of my words are to release my passion, my heart and my love for my husband as we walk this final journey together. I am so glad that the final requirement for writing is NOT the ability to spell correctly. If it were, I would never write a thing…At least, I can get the word close enough that spell check gets a hint of what I am trying to write…Before, spell check, I used a dictionary a lot…. My quest was in searching for people who could relate to my experience and if I found them, I was no longer alone. I was hoping that should I find them, they would realize that I could relate and experientially understand their personal quest…so, relevance makes words “roar”. The next task is to recommend 5 other blogs….I hate to admit it, but I rarely read other blogs than those who either recommended me or who I was recommended with i.e. Roads and Nicole3 ( http://nichole3.wordpress.com/) There are many excellent blogs that express personal sorrow and the challenges of death and dying. Sprinkled through out my story, are milestones and tragedies that find their roots in my years of being a stepmother. Those years were impacted by some of the same challenges that Mrs. H finds in her present days. I enjoy reading her blog and following her story and her insights on this important role that she plays in her stepsons lives. There are many commonalities of her experiences with those that I experienced….She has all of the elements that I noted that make writing “Roar”. These are my recommendations for the “Sites That Roar” Award….However, I didn’t know that I “roared”. I recently experienced a few incidents that caused me to realize that I need this blog more than I need any “tool” as I walk this path. This blog has become an outlet as well as a focal point on my journey. When I thought that my blog was beyond retrieval, I discovered an intense feeling of being lost without my bearings. I felt great sadness.